YWTF-DC is a grassroots volunteer-led organization dedicated to connecting, educating and empowering women ages 21-35 in the DC Metro area. 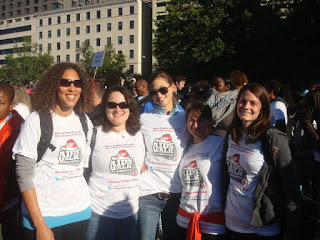 YWTF-DC has always participated in service activities in the DC Metro Community. This year we wanted to take our passion for helping others a step further by creating the Take Charge of Your Service program (TCYS). As members of YWTF-DC the power is in your hands! Do you have an idea for a volunteer event or activity? Are you currently involved with a volunteer program you would like to share with other YWTF-DC members? Let us know! Take Charge of Your Service means you help decide which service activities YWTF-DC members participates in. Send us your ideas and we'll plan volunteer activities! Email us at ywtfdc@gmail.com. Looking for ways to get involved in the DC Community? Check out these great organizations! Yoga Activist, inc. is organized to build connections between qualified yoga instructors, social service providers, government agencies and communities that have little or no access to the science of yoga and its use as a self-empowerment tool. Follow us and Contact Us! Email us at ywtfdc@gmail.com with questions or suggestions or to sign up for our listserv. You can also manually sign up to receive our email alerts here. Join our Email Mail List Today!